The GuruFocus podcast brings interviews with influential investing leaders, extended discussion with website contributors, original stories and all the happenings in value investing. Tune in to stay fresh on the world of money and give your portfolio an edge, on the go. One of today’s foremost value investors, Mohnish Pabrai joined GuruFocus to share his insights and discuss recent portfolio moves. Pabrai, the founder of California-based Pabrai Investment Funds and Dhandho Funds, went into why he has shifted most of his $1 billion portfolio from the U.S. to India, and disclosed that he made new investments in Turkey and South Korea. He also described what drove his fourth-quarter investment in U.S. company Micron Technologies. Regarding his investment style, the Buffett disciple talked more about some of his key concepts, including price-earnings ratio of 1 stocks, his checklist and the No. 1 mistake investors make. Craig Thrasher, CFA, is an international small-cap expert. In this podcast, he discusses how he has achieved his outstanding returns in an area that abounds in growth and opportunity. Small caps have historically beaten their large-cap peers and offer a large universe of undiscovered companies to choose from, while having lower volatility than domestic investors may think. Thrasher believes in bottom-up analysis, has concentrated portfolios and seeks only high-quality businesses. In the interview, he talks with GuruFocus about how this plays out when investing internationally. He also gives some of his stock recommendations and shares his thoughts on portfolio holdings. Jerome Dodson runs San Francisco’s Parnassus Funds, where he has blazed past the S&P 500 while investing in socially responsible companies. In this podcast with GuruFocus, he discusses his style of value investing and what investors should do in the return of volatility as higher interest rates and trade battles strike. Dodson also covers some of his favorite sectors and companies, including Google, Micron and Starbucks. John Dorfman, founder of Massachusetts-based Dorfman Value Investments, joined GuruFocus to talk about his style of value investing. John’s approach has led to market-beating returns of 9.79% annually since inception versus 5.4% for the S&P 500. In this episode, our guest tells where he is still finding obscure opportunities in a crowded market, what effect tariffs will have on small caps and why value investing is set to stage a comeback. The investor, who was mentored by the legendary David Dreman, also explains the findings of his studies of low-P/E stocks and analysts’ most-loved and most-hated stocks. Jim O’Shaughnessy wrote the wildly popular investing book, “What Works on Wall Street,” in which he documents the strategies that sank or soared during over long periods, with some surprising results. In the podcast, Jim expounds on the follies of predicting markets and how a composite approach outperforms. It’s only possible, he says, if you can eliminate those pesky emotions. Jim will also give a presentation at the 2018 GuruFocus Value Investing Conference. Joel Tillinghast, who runs the $38 billion Fidelity Low-Priced Fund, joined GuruFocus for a podcast interview about how he thinks about investing and selects equities. The most distinctive characteristics of Tillinghast's portfolio are its size -- it has 889 positions -- and its requirement that its stocks have a price under $35 per share. It also has uncommon returns. Since inception, he returned 13.76% versus 9.78% for its benchmark Russell 2000 index. In the extensive interview, Weitz elucidates his investing process and answers questions ranging from rising markets and geopolitics to individual stocks and what he thinks is inexpensive right now. He issues caution about "raw materials" in place for a correction, and explains why his flagship fund, Partners III, is shorting indexes following the S&P 500 and major market indices. 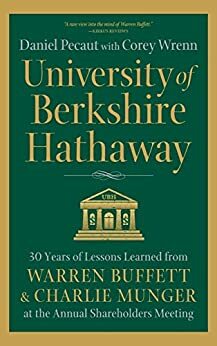 Daniel Pecaut and Corey Wrenn discuss their new, highly rated book, University of Berkshire Hathaway. In the unique collection, they share their notes from 30 annual Warren Buffett’s annual shareholder meetings, beginning in 1983. The authors speak with GuruFocus about the making of the book and the insights they gained from their unprecedented journey. Daniel Pecaut is a Harvard graduate whose insights have been featured in the New York Times, Money Magazine, Grant's Interest Rate Observer, Outstanding Investor Digest, and the Omaha-World Herald. He has worked in investing for 30+ years and is CEO of a successful investment firm, Pecaut & Company. Corey Wrenn has a B.S. in Business Administration from University of South Dakota and an M.B.A from University of Nebraska at Omaha. Corey is the Vice President, Treasurer, and CCO for Pecaut & Company. Before he joined the firm in 1992, he worked for 9 years as an internal auditor for Berkshire Hathaway. Legendary investor Jean-Marie Eveillard previews his talk "Value Investing Makes Sense, It Works Over Time, So How Come There Are So Few of Us?" He also goes into market crashes and what they do to investors psychologically. How do you invest in health care when bills are failing and policy is up in the air? Is drug price regulation still a danger? Will single-payer spell the end of health care investing as we know it? Mindy Perry, who grew her global health care fund from $5 million to $2.5 billion in eight years, brings the latest from "a strange sector" and shares her strategy. She also offers a preview of her talk for the value investing conference. In an interview with Bill Smead, GuruFocus digs into the Wells Fargo fake bank accounts scandal that incurred it a $185 million fine and unearthed some other misdeeds. Smead, a popular commentator and the founder of Smead Capital Management, a $2.4 billion firm, talks about the problems in the banking sector, why Millennials will invigorate low-priced financials, how the fallout of the scandal will affect Wells going forward, whether the bank is a buy and more. Al Frank Asset Management Chief Portfolio Manager John Buckingham and Wedgewood Partners Chief Investment Officer David Rolfe discuss their holdings in Apple. Why is Berkshire Hathaway buying more of the stock? How will iPhone sales affect its business? What are its future prospects? The investors answer these and more questions.